troy lee designs motocross kit. Dispatched with Royal Mail 2nd Class. One Industries Atom Motocross Glove Size XL. Black and White Condition is New with tags. Purchased couple of months before I sold the bike and never got round to wearing them. Also selling some other related MX bits please see my other auctions. Dispatched with Royal Mail 1st Class. You are bidding for a set of used motox gear as follows: Alias trousers red/ yellow waist 24” Alias race shirt red/yellow youth medium Pair of red/black Fly youth 5 gloves Usual wear and tear, a couple of small holes in the top. Small tear (approx 1cm long) on one leather patch on trousers. Ideal for anyone learning to ride or as a spare set of gear. You are bidding for a set of used motox gear as follows: Troy Lee Designs trousers flo yellow/green waist 24” Troy Lee Designs race shirt youth medium Pair of 100% goggles with tinted lens, small scratch approx 1cm long) on lens Replacement youth lens gold mirror Pair of Troy Lee Designs gloves green/black youth S Pair of 100% green/black gloves youth S Usual wear and tear, patches on trousers have been replaced, top in v good condition Ideal for anyone learning to ride or as a spare set of gear. Used twice . Moto X Kit. Condition is Used. Dispatched with Royal Mail 1st Class. One Industries Atom motocross Combo Large Jersey and 36” Waist pants. New unworn without Tags. Purchased couple of months before I sold the bike and never got round to wearing them. Also selling some other related MX bits please see my other auctions. Dispatched with Royal Mail 1st Class. New listingKids Wulf mx helmet and gloves. Both in very good condition and very clean. No-fade sublimated graphics. Sewn in liner. Ratchet style waist closure. Double and triple stitched. Thor Pulse Kit. Versatile fit. Sublimated no-fade graphics. Heat transferred neck label. Full polyester construction. Off-road motorcycling and motocross have grown ever more popular in recent years, thanks in no small part to such televised events as the Red Bull X-Fighters. With bikes large and small, this is a hobby being taken up by both young and old alike. But being a fast, frenetic motorsport, wearing the appropriate motocross off road clothing kit is vital to reduce the impact of any unfortunate falls and to keep your hobby fun and safe. 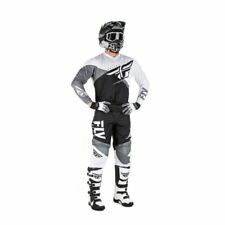 High-quality motocross off road clothing kits and sets, such as those from Alpinestars and Wulfsports, are formed from nylon and poly-fabric hybrids. They are also reinforced with Kevlar in key areas which is extremely durable and abrasion resistance, helping to reduce cuts and grazes. Certain kits and sets feature leather heat shield panels located on the inside of each leg for extra protection, durability and heat resistance. Motocross is a very physical sport and you’re bound to build up a sweat, but luckily many motocross kits are built with moisture wicking properties, as well as antimicrobial coatings, helping to prevent discomfort and distraction. Look out for suits with mesh ventilation panels to help air flow, keeping you cool during the warmer months. 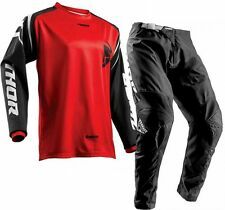 Certain motocross off roading clothing kits and sets come with a jersey, trousers and gloves. When looking for gloves, it is important to make sure they are well ventilated and highly protective. Gloves with mesh panels and air vents keep your hands from getting too sweaty to control your bike, whilst sturdy construction and rigid armour will help protect in the event of a fall. Motorcross off road clothing kits and sets are available in a range of different colours, bold prints and bright designs so you will certainly find a kit to suit your style and keep you protected.